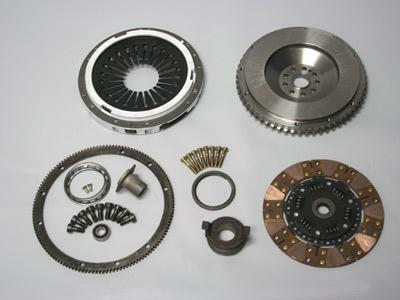 The Evolution Motorsports Stage 4 Clutch is a clutch package that was developed and engineered “in house”. We utilize an OEM Sachs “999” MotorSports pressure plate and increase the clamping force of the by about 500 Lbs. This clutch kit utilizes the technology from the Evolution Motorsports Stage 3 system with the addition of our lightweight aluminum flywheel. This high clamp force pressure plate combined with our custom designed sprung hub ceramic disk will hold high horsepower applications without slipping. This system was specifically designed for use with our billet aluminum lightweight flywheel for a more aggressive clutch setup. This system is suitable for daily street driving and capable of handling the road course as well as the drag strip. NOTE: This is an aggressive clutch system. When the OEM dual mass flywheel is eliminated and replaced with this lightweight flywheel, the transmission noise is amplified. There is a transmission rattle at idle which can be heard in the cabin. Additionally, the clutch engagement is quicker with a reduced “sweet spot” which may take some time to get use to.